Nellie Cheng, director of USGBC global market development, and Mark Ginsberg, senior fellow at USGBC, spoke to participants at the 13th International Conference on Green and Energy-Efficient Building and New Technologies and Products Expo in Beijing, China, on March 22. As China’s largest green building event, the conference is one of the most important platforms for professionals across the world to learn the latest development of green buildings in China, with two days of programming featuring dozens of forums and workshops covering a wide range of green topics. By the end of 2016, China had become the largest market for LEED-certified projects outside the United States. With over 1,000 certified projects, LEED has been continuously building its reputation in China and strongly supporting the country’s green building market transformation. Cheng and Ginsberg were invited to present at four key sessions hosted by renowned Chinese developers and professional institutes, to share their expertise and best practices in the world green building market. 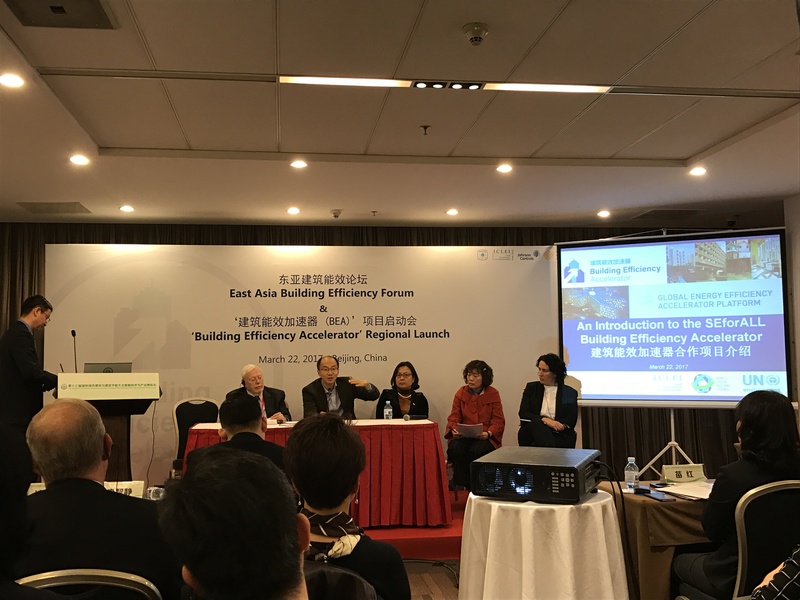 In addition, Ginsberg was invited to the Building Efficiency Accelerator (BEA) forum as one of the experts on its panel discussion, which aims to assist subnational governments in speeding up the process of adopting best-practice policies and implementing building efficiency projects. Above: Mark Ginsberg at BEA's panel discussion. Feature image at top: Nellie Cheng delivering a speech at the forum on market development for green building.